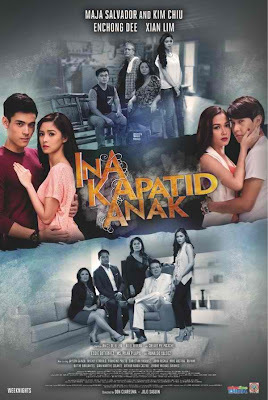 I was lucky enough to watch the first week episode of ABS-CBN’s newest drama “Ina, Kapatid, Anak” at Trinoma on Friday for its advance screening for fans, bloggers and some members of the press. I can say that this one’s another “Ina, Kapatid, Anak” is a compelling drama about fighting for love and honor. More than a story of atypical family, this tackles the issue of surrogacy – of whom will be the mother of the surrogate baby? Is it the one who owns the egg cell or the one who carries it to birth? Janice and Ariel play as couple in this series who are unable to conceive a child on their own and choose to use a surrogate mother (played by Cherry Pie, who happened to be Janice' half sister in this series) which will carry their child. Janice is wife of Ariel who is not able to implant the embryo because she has inverted placenta, that's why they decided to make her embryos transplanted into the surrogate mother. The eggs may be fertilized by the biological father or by artificial insemination if the male has fertility issues. It’s still debatable until now because this is a very complicated topic and lots of ethical and moral issues. It was not primarily a money factor that led them to make the decision. Mostly these women are employed and are not undergoing financial difficulties. Sometimes a surrogate mother changes her mind and refuses to give up the child. However, in the Philippines where surrogacy is not allowed, the biological mother usually does not win custody or visitation rights. There is always the chance that the surrogate mother might win her case. This series also contains a lot of quotable quotes from its actors. One of the best so far is the confrontation line between sisters Cherry Pie to Janice, “Sinapupunan ko lang ang pinahiram ko, hindi ang pagkatao ko!” This one’s the most applauded among all the scenes during advance screening. This another ABS-CBN's offering for the fourth quarter of the year which topbills today’s hottest young stars including Maja Salvador, Enchong Dee, Xian Lim and Kim Chiu with highly-acclaimed seasoned actors Janice de Belen, Cherry Pie Picache, Ariel Rivera and the veteran stars including Ronaldo Valdez, Pilar Pilapil and Eddie Gutierrez. Just like what I've seen in "Budoy," this will surely be a big hit and I know, this will win a lot of awards especially the lead actors of this series! Very nice... always kakakakilig ang teleserye na ito. Nice true to life series but..."anong ginagawa mo dito..." dialog is overused. Almost every day, it is used with at least one character. Kinda tired of hearing it. Last three weeks, I find Celyn's character to be so contrary. Before, when Ethan brings up the problem with Margaux, she's very quick to assure Ethan, not to worry and all that. Then suddenly, when Ethan has moved past the problem with Margaux, Celyn keeps pushing Ethan to be concerned with Margaux, why she hasn't left etc. REALLY! Kim Chiu's mannerism is overused. Even when the scene is intense, she never fails to touch her hair. Having John Regala in this series seems , they will be havingbrutality scenes. I hope that they just continue the light yet "makabagbag damdamin" na teleserye without incorporating those gross scenes and brutalities. and hoping that they could change the common ending of "patayan" like what they did in walang hanggan and other series in ABS CBN.